On first glance, the words have little to do with the Mountain State. A quote from Leviticus 25:10. The names of the two foundry workers who recast the bell - John Pass and John Stow. The year 1753 in Roman numerals. But the bell sitting in front of the West Virginia Capitol is relevant, for it invokes the spirit of its counterpart in Philadelphia, the Liberty Bell. The first time the Liberty Bell was rung in 1753, it cracked and had to be recast. After being recast yet again to restore the proper sound, it hung in the steeple of the Pennsylvania State House (now known as Independence Hall), where it would stay until the American Revolution. As the British approached Philadelphia, it was hidden under a church in a town north of there. After the war was over, it sat in storage for seven years until a new steeple was built. In 1787, after being rehung, it rang to celebrate the ratification of the new Constitution. The hanging of the replica Liberty Bell in front of the Capitol was a little less eventful, but no less appreciated. The replica was one of 53 produced in France and given to the United States government in 1950. It was presented to the state that year in commemoration of a U.S. Savings Bond drive - “Save for your independence,” the campaign’s slogan instructed. When it was first brought to West Virginia, it toured the state until finally resting upon the grounds of the Capitol Complex. It once set on the steps on the north side of the Capitol but has since been moved to its present location. The original Liberty Bell was rung as a way to mark special occasions, both celebratory and somber. Contrary to what the plaque above the replica at the Capitol says, many historians doubt that the Liberty Bell was rung in 1776 to celebrate the signing of the Declaration of Independence because the steeple was in disrepair. However, it did ring in 1775 to announce the Battle of Lexington and Concord - the Shot Heard ’Round the World. The Liberty Bell was used to mark the deaths of several Founding Fathers: Ben Franklin, George Washington, Alexander Hamilton, John Adams and Thomas Jefferson. 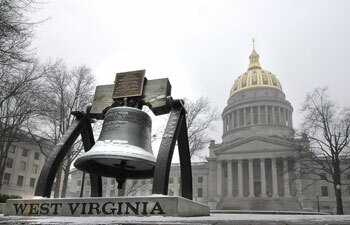 Likewise, the West Virginia bell tolls but seldom. Every year, it is rung on Martin Luther King, Jr. Day to honor the late civil rights leader. It has been used for somber events, such as the anniversary of the September 11 attacks. Its tone - identical to the one produced by the bell during the 18th century - rings loudest through silence, just as light shines brightest in darkness; a solemn reminder of West Virginia’s resolve in the face of catastrophe. The West Virginia Liberty Bell does differ from the Philadelphia bell in one major regard. On Feb. 27, 1846, the original bell rang for hours in honor of George Washington’s birthday. As it rang, a crack that had previously been repaired reopened and rendered the bell unusable. The bell has never been rung since, but the crack has become a distinctive part of the Liberty Bell. The replica does not bear this crack but is instead based on the original design of the bell. House Bill 2105 will extend the expiration date of provisions permitting retired teachers to accept employment as substitutes in areas of critical need and shortage for an unlimited number of days without affecting retirement benefits. The provisions expired on June 30, 2006. This bill will put the provisions back into effect by changing the expiration date to June 30, 2010. House Bill 2141 would raise the age at which a person may request to be excused from jury duty from 65 to 70. This is an attempt to put jury duty practices up with our sexagenarian population’s increased vitality and our state’s aging populace. House Bill 2285 would update the meaning of “federal adjusted gross income” and certain other terms used but not defined in the West Virginia Personal Income Tax Act. It would also establish that the term “taxable trust” does not include a medical savings account. House Bill 2314 would update the meaning of “federal taxable income” and certain other terms dealing with the Internal Revenue Code and that relate to the calculation of a person’s income for federal income tax purposes. House Bill 2315 would expand the types of crimes included for the preparation of a “Parole Hearing Notification Form.” This would also call for the parole board to notify the prosecuting attorney, among others, of the time and place at which a parole hearing will be held 45 days before that date. House Bill 2294 would require a certified expert to examine underground mines for hot spots which may have been discovered after any cutting and /or welding that has been performed in and around the area of an underground mine. House Bill 2300 would allow the release of the name and identification of a juvenile adjudicated or convicted of a crime to the victim of that crime. House Bill 2307 would authorize county commissions to use certain monies to fund the building and operation of libraries and to administer and provide affordable housing for individuals or families of low or moderate income. House Bill 2311 would allow the Executive Director of the West Virginia Regional Jail and Correctional Facility Authority to establish a work program for qualified inmates sentenced to a regional jail facility. This would also allow provisions to provide that inmates be gainfully employed with local businesses as part of this job program within each jail. House Bill 2380 would exempt the purchase of certain drugs, durable medical goods, mobility enhancing equipment and prosthetic devices intended for use in the diagnosis, cure, mitigation, treatment, or prevention of disease in humans from the consumers sales and service tax. House Bill 2383 would allow a school service mechanic to have experience training and certifications considered toward his or her pay. Also considered in a mechanic’s pay rate will be the years of experience, any special training as a mechanic or any specific certifications held by the mechanic. House Bill 2390 relates to the definition of domestic animals and livestock, the purpose being to allow owners of nontraditional livestock such as deer, ostrich, llama, etc., to recover damages against the owner of any dog that kills or wounds such livestock. House Bill 2392 would provide for the reexamination of drivers holding valid drivers licenses who are observed by police officers violating traffic laws or who appear to have caused accidents as the result of negligence or inadequate driving skill. House Bill 2398 would amend certain provisions involving dental hygienists to allow them to perform their duties without direct supervision in the following locations: hospitals, schools, prisons, community clinics, long-term care facilities, nursing homes, home health agencies, group homes, state institutions under the Department of Health and Human Resources, public health facilities, and accredited dental hygiene education programs. House Bill 2412 would create the Indigent Defense Commission to assist Public Defender Services with regard to the general operations of the agency, and to provide additional oversight of the costs and administration of the public defender corporations. This would also allow, among its provisions, public defender corporations to work with private attorneys to provide direct representation to eligible clients in the event that the corporation cannot provide representation themselves. House Bill 2417 would require a mandatory alert when natural gas or other petroleum product pipeline facilities are observed to be in a damaged state that may endanger life, cause serious bodily harm or do damage to property during commercial activities in the area of pipeline facilities. The proposed legislation, additionally, provides civil and criminal penalties for violators. House Bill 2422 would provide cost saving measures for the medical care for regional jail inmates. This bill would limit payments to outside medical service providers to amounts no greater than the reimbursement rate at issue under the Department of Health and Human Resources Medicaid Program. House Bill 2434 would implement public employee acceptable use standards for the use of the Internet. It is designed to prohibit, among other things, public employees’ use of computer equipment and communications services that are the property of the state and for private business purposes, as well as for political purposes of a partisan nature including campaign purposes. House Bill 2444 would allow police officers and Public Service Commission employees to issue citations of $250 to owners of railroad cars or equipment for blocking a public highway railroad grade crossing for twenty-five minutes or more, except when due to mechanical failure or accident. Senate Bill 138 would remove from state law a provision that would allow a magistrate, at the request of a defendant, to require the posting of security by a nonresident plaintiff to cover court costs. Senate Bill 139 would clarify that name change petitions in circuit court family courts, are to be denied if the court finds the petitioner is seeking the name change for illicit reasons or has misrepresented any facts required to be verified in the petition to the court. Senate Bill 140 would clarify that $10 of fines and fees collected in civil and criminal cases in magistrate court be deposited into the magistrate court fund. Senate Bill 141 would provide that family court has jurisdiction over all petitions for sibling visitations. Senate Bill 142 would provide a penalty for illegally possessing, possessing with intent to distribute or distributing an iodine matrix. Iodine matrix is considered to be a drug associated with the manufacturing of methamphetamine. Anyone who violates this is guilty of a misdemeanor and upon conviction may be fined up to $10,000. Provisions in the bill exempt a variety of professionals. Senate Bill 124 would give a tax credit to underground mine operators who purchase certain equipment intended to improve miner health and safety. The credit goes against the severance tax or the business finance tax for up to half of the cost of the equipment. Senate Bill 130 would excuse active duty military personnel who are serving outside the state from paying ad valorem taxes, Latin for “according to value,” on one full or partly-owned motor vehicle. The serviceperson must be stationed outside the state on July 1 of the assessment year to qualify for the property tax exemption. Senate Bill 133 would require health insurance companies to cover smoking cessation services and techniques in a beneficiary’s policy. Consultation, examinations, drugs, or counseling are among the techniques that must be included in the health plan coverage by this bill. Health Insurance companies are banned from imposing a deductible, co-payment, or other cost-sharing mechanism, or waiting period for any approved prescription or service. To ensure that these requirements are met, the Insurance Commissioner would oversee all complaints, and determine if a violation has occurred. In the event that an infraction is found, several penalties can be imposed, including a fine of $10,000, with an extra $10,000 for every 30 days the plan is still not in compliance; or a suspension of the health insurer’s certificate of authority. Senate Bill 135 would change a current West Virginia law to include spouses of Army, Navy, or Marine personnel killed in action, or who have died as a result of illness resulting from their war service, to receive educational aide resources. Currently, state laws only provide this opportunity to the children of the personnel. The State Fund would give $5,000 each fiscal year that the child or spouse attends post-secondary education or a training institution, and would waive the tuition fee for spouses who meet certain qualifications. A spouse cannot be older than 40 and he or she must be listed as a West Virginia resident. Senate Bill 137 would regulate the use of “black boxes” that are installed by motor vehicle manufacturers in newer models. A “black box” is a device that records vehicular data such as how fast a car is traveling, where it travels, steering and brake performance, and seatbelt status, and in the event of an accident this information is sent to a central communication system. This bill regulates who may retrieve or download the recorded information other than the owner of the vehicle. It may be recovered with the owner’s consent, a court order, by an auto technician for diagnostic or repair purposes, or by the manufacturer for the purpose of safety and impact research where the owner’s name is not disclosed. Senate Bill 146 would provide a tax credit to medical providers in the amount equal to their expenditures on electronic medical records technology. Senate Bill 147 would amend a current West Virginia Code that presently allows counties to call for a three percent Occupancy Tax. This bill would raise the amount to six percent of the retainer paid for the use or occupancy of a hotel room, and if passed, it would be effective on July 1, 2007. Senate Bill 154 would authorize the West Virginia Secondary Activities Commission to create and inform the community about a mandatory drug testing program for student athletes. The Commission would have the ability to establish a procedure for appeal, publish a list of banned substances, and create a medical advisory board. Any student athlete who tests positive, refuses to test, or reports his or her own violation must forfeit any individual honor received while in violation and would not be eligible for sports until he or she has undergone counseling and produced a negative result. Senate Bill 155 would give County Commissions the authority to establish a tax on alcoholic beverages sold at private clubs within their territory, as well as the authorization to establish a special account for the deposit of funds received from the aforementioned tax. Any tax determined by the County Commission cannot exceed 35 percent of the drink’s cost. Senate Bill 160 would establish the Flood Protection Planning Council. The council would consist of five members, including the Director of the Division of Natural Resources, the Secretary of the Department of Environmental Protection, the Executive Director of the West Virginia Conservation Agency, the Secretary of the Department of Military Affairs and Public Safety, and the Secretary of Transportation; while giving each member the ability to appoint a designated replacement. An Advisory Committee with members from relevant state and federal agencies would assist the council in its duties. A Joint Legislative Oversight Commission on Water Resources would oversee and approve the expenses of the council. Senate Bill 163 would make the destruction of a landlord’s rental property a criminal offense if the tenant were found to act with reckless disregard. If the damage is greater than $300 but less than $1,000, then the tenant would be charged with a misdemeanor and upon conviction could be fined up to $300 or up to six months in jail, or both. If the damage is greater than $1,000, then the tenant would be charged with a felony offense and upon conviction could be fined up to $1,000 or sentenced to jail from one to 10 years. This bill also establishes the use of video or photographic evidence of the destruction, in conjunction with credible and trustworthy testimony, as proof of the offense. Senate Bill 167 would relate to requiring the Department of Health and Human Resources to develop in-state treatment facilities for children with special needs. Children respond better in treatment when families are involved.